anyone has Kahaluu avacado that would be willing to sell/share/trade budwood? I can offer Anona/cherimoya wood that I have already listed. I am tired of looking at leaves like this year over year. What is causing it and how do I fix it? Amazingly I got all three types of guava ripe at same time. Asian white super sweet Malaysian red, and Ruby x supreme. Here is another mango. came from USDA labeled as Swehinthar, but it didnt turn out to be one. Color as you can see was red blush on shoulders, rounded mango, thick skin, very piney, and texture of pulp is not creamy but more like fruit cocktail mango. wondering what variety could it be? It has mono seed. every year here in So Cal we get recent grafts that barely pushed or dormant to start blooming instead of growth in Spring and when you knock out blooms OR wait for fruitlets to be pea size to knock them off, soon after grafts and small plants bloom again, cycle about 2-3 times at expense of growth. any good way to prevent stop blooms? I heard folks use KNO3 for blooms, what is the antidote to stop blooms? Can you ID this mango? its fiberless orange creamy flesh, sweet and slightly piney. Absolute round shape. doesnt have complexity or acid component. A lot like Alphonso but its not. My yard has been infected by Fruit Fly in my guavas and its been bad since 3 years ago and this year is no exception. Every year I see traps installed by County USDA so they can trap and study flies. This year they skipped my guavas for some reason. I searched online and found very limited lures and traps that actually work. Besides some home remedies, wanted to know what others are doing to control it? I can facilitate McPhail traps and lures (only available to Govt. otherwise) but would need a larger group to participate. wanted group opinion and thoughts. if you are already practicing fruit fly control, would love to hear from you your measures and sources of lures and traps so I can get them for my yard. Looking for Fernandez Custard Apple Wood. this is part of breeding program in CA where I plan on creating hybrids using Pierce and Helmut, the two best cherimoyas with red fernandez custard apple. Idea is to see if some of the color of Fernandez can be induced into cherimoya. Please PM me, if folks locally are growing in CA, that would be great as then I can have fresh wood. I also have lots of other anona varieties for trade OR will pay! Has anyone tried this mango OR is growing it? Please post a pic and your opinion about it if you tasted it. USDA suppose to have it, but pictures online vs. fruit in my yard are conflicting. Its suppose to be No. 1 mango from Myanmar. Here is picture from my garden, looks a lot like picture in article below. Tasted today and wow. Excellent sweet flavor with mild pineyness, hard to describe taste. Brix 26, seed was polyembriyonic. 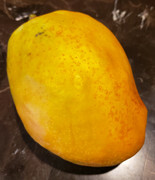 Please ID these mangoes, I got them from USDA and buy they also mistag or get things mixed when shipping. This was supposed to be shehintha (swe-hin-thar) but its not. This was said to be jahangir, does it look like it? Tropical Fruit Buy, Sell & Trade / No Mai Tze Lychee Wood GONE!!! I got 5 or 6 PC's of No Mai Tze wood if anyone wants for free, just pay shipping. I will split into two people, first come first serve. I got it from USDA and don't want it to go waste. $5/ea, 2 min. $3.35 regular mail or $7 expedited shipping. Limited availability. wood was prepped and its ready to take. Its buddy taped and harvested today. Is this any kind of keeper fruit plant or just junk? most my mangoes are less than 3 yrs in ground. looks like now they are starting to takeoff. see pics here. A lot of times folks send wood for grafting and end result sometimes is a failure of graft. besides other reasons for failure, one thing you could do is prepare the scion before you harvest. This is the best thing you could do to ensure whoever gets the wood has maximum chances of take. see pictures below, this is how I prep. I remove the terminal bud from hardened growth, cut all leaves off. in about 3 days, the ends of leaf stems will fall off. In about 7 to 10 days, the leaf nodes will start to swell. Once they are swelled you harvest wood, seal it and send away. When buds are swelled, the budwood is fully energized ready to roar into growth post grafting. The picture below, it still has few more days of bud swelling left before I will harvest. I dip the cut ends (usually bottom) into warm melted wax to seal moisture., then put it in a sandwich bag that also have moist vermiculite in it. I have successfully sent packages to other side of globe and were viable even after almost 2 weeks. Can someone ID this Avacado variety by looking at leaves or spots on branches? It is a top tier but I can't find tag. Stem does not look like Pinkerton nor do the leaves. Tropical Fruit Discussion / ID this Mango (Picture attached), click to enlarge!! I got this as a peach cobbler from TT, tree declined upon delivery so I got a replacement. Replacement has been fine and real peach cobbler. However the declined tree in Green House pushed few shoots before passing away. I was able to graft those shoots and now I have it fruiting. The fruit does not look like peach cobbler at all. Fruit is a bit flat and wide, and is bumpy, looks like Coconut Cream? It should ripen in about 4-6 weeks but wanted to know if someone can ID it, so I can harvest its wood and spread around if its good.